It's time for my monthly fitness recap! Can I confess something here? I've completely fallen off the whole crosstraining wagon. I didn't do any crosstraining this month! None! Terrible, I know. But I'm running and enjoying it, and that's all I want to do right now. Crosstraining will pick back up for me when the weather turns colder. So this month I ran a total of 97 miles. I had really hoped to hit 100 miles, and I came close. Maybe July will be a triple digit month for me. I also got to the track twice. My longest run this month was 10 miles - finally back up to 10 milers. I did two of them this month. It was nice to run with some distance again. I have a race in July! That's right, I'm actually registered and everything. So look for a race report in the near future. I'm nervous, since I haven't raced in 8 months or so. I realize I'll be slow, but at least my IT band is doing much better. Speaking of which, I am now only going for Active Release Therapy (ART) treatments once a month. I am so impressed with this therapy. It has really made a huge difference, and had I not done it I'd probably still be sitting around missing my runs. In other exciting June news, my parents got me a pair of compression socks for my birthday. I have been wanting to try them for a while, particularly because in coming back from an injury my legs seem to fatigue really easily. These are from http://www.zensah.com/. 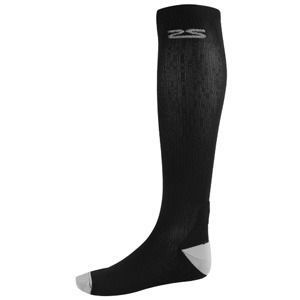 Anyone else out there tried out compression socks? In summary, June was a great month for running, and I'm hoping to keep it fairly steady in July. I still haven't figured out what races I would like to target for the fall, so I'm mulling that over and hopefully I'll have some ideas by the time I do my July fitness recap. Good for you! Running is something I've never attempted, but I manage to get in a good walk almost every morning. I wore compression stockings briefly. My dermatologist told me I should, because he noticed veins in my ankles looking a little "puffy". He said they might save me problems down the road. They're pretty uncomfortable, though, so I stopped wearing them. Who knows? I may end up having to at some point! They put those socks on me when I had surgery. Does that count? Good for you Lisa. I loved to run back in high school days. Here in Atlanta, everyone trains for the Peachtree Road Race on July 4th each year. 97 miles sounds like a lot to me. The socks sound like they will really be helpful. You'll have to let us know how they work for you! You go, girl! I hope the socks work, the therapy continues to help and you hit those triple digits in July! Well, I have tried on the compression stockings and seen a lot of them. But never heard of compression socks! Are they pretty much the same, are the socks not as tight? With the compression hose, I can't even get them on! They sell a little machine thing that helps put them on, believe it or not. So I figured that anything that takes a machine to put on is not for me! Hold it Lisa. All this talk of stockings and socks is having an effect! Thank God you didn't post any pictures of you actually wearing them. That would have been too much! There's a run around my 'neck of the woods' called The Robin Hood Marathon that I've been threatening to do for years but never have. Might give it a go next year for a charitable cause. Would a years training be enough? Lisa, let me know how you like those compression socks, please. I'm flying to Budapest later this month and am thinking about wearing a pair. You've fallen off the cross-training wagon? Heck, I've fallen off the exercise wagon! You are on track in that department for sure...I'm lucky if I log 40. Really. Way to go, 97 miles is an accomplishment!!! As for the compression socks, I've heard really good things about them!! I have a friend that wore them during clinicals in nursing school and she said they made a huge difference! I'm definitely looking into them!!! Thanks for the website!! !